Ori Menashe and Genevieve Gergis are following up their hit Italian spot Bestia with Bavel, a Middle Eastern restaurant also located in downtown LA's Arts District. Bavel, 500 Matteo St., Los Angeles, CA 90013, 213-232-4966. Hollywood’s stylish new Emerson College building on Sunset is host to restaurateur George Abou-Daoud’s latest casual spot, Common Project. Look for American bistro fare from chef Leo Bongarra, including a sirloin burger, salmon Niçoise salad, wild mushroom mac and cheese, meatloaf with mashed potatoes and steak frites, served in an airy, modern dining room. Common Project, 5960 Sunset Blvd., Los Angeles, CA 90028, 323-952-6243. Making the jump from NYC, chef/restaurateur April Bloomfield (The Spotted Pig, The Breslin Bar & Dining Room) has opened Hearth & Hound in the former The Cat & Fiddle location on Sunset Boulevard. Hearth & Hound, 6530 Sunset Blvd., Los Angeles, CA 90028, 323-320-4022. David Chang (Momofuku) has made his way to LA with Majordomo in north Chinatown. Expect Chang’s signature Momofuku stylings on dishes like seasonal braised vegetables and short rib and a focus on other meats from the smoker. Majordomo, 1725 Naud St., Los Angeles, CA 90012, 323-545-4880. LA dumpling lovers may soon have to go only as far east as Highland Park for their fix, as San Gabriel’s Luscious Dumpling Group will open Mason’s Dumpling Shop on Figueroa Street sometime after New Year’s. Look for the likes of steamed soup dumplings, pan-fried pork dumplings and boiled chive dumplings as well as stewed beef and pork belly noodles and combos. Mason's Dumpling Shop, 5803 N. Figueroa St., Los Angeles, CA 90042, no phone. Restaurateurs Anne Conness and Nancy Vrankovic (Sausal) have opened Jaffa in the former Blue Plate Oysterette space on West Third Street. Look for seasonal, modern Israeli cuisine with a focus on dishes like zeitgeist-driven roasted cauliflower, grilled eggplant with pomegranate, house-made hummus and salads. Jaffa, 8048 W. 3rd St., Los Angeles, CA 90048, 323-433-4978. Chef Kris Yenbamroong’s newest outpost of Night + Market has opened on Lincoln Boulevard in Venice. Night + Market Sahm offers grilled and spicy Thai fare from a menu similar to the ones at the WeHo and Silver Lake locations. Night + Market Sahm, 2533 Lincoln Blvd., Venice, CA 90291, 310-301-0333. 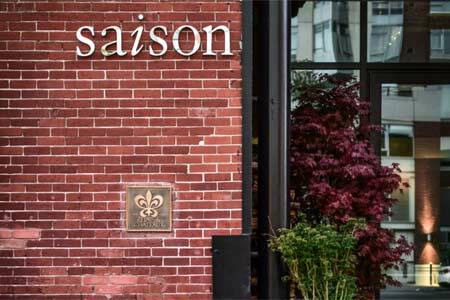 San Francisco restaurant Saison is expanding with a new, seafood-focused concept, Angler, which will open first in the Bay Area and later in Los Angeles. In LA, the raw bar and grill will open in Fall 2018 at the Beverly Center (joining Michael Mina's Cal Mare). Angler, Beverly Center, 8500 Beverly Blvd., Los Angeles, CA 90048, no phone. Walter Manzke and Margarita Manzke (République) will open a new restaurant in the historic Herald Examiner building in downtown on Broadway and 11th Street. The 1914 building, which is currently being revamped, was designed by Julia Morgan, who also was the architect of Hearst Castle.